The Guardian is reporting that Caster Semenya has gone into hiding and is receiving "trauma counseling" after the results of her gender tests were publicly announced last week— tests, her mother claims, Caster didn't know anything about. "I don't care about what they say she (Caster) is, because I am her mother. But what makes me angry is that, as parents, we were not even told she was going to be tested," Dorcus Semenya tells the Independent News and Media, "What is even more heartbreaking is that my child said she was not told anything about the tests. Now I heard they were trying to contact her about the results. How could they want to inform her about something she does not even know about? Is that fair?" Semenya claims that her daughter was unjustly humiliated by officials, who waited until after Caster won the race to begin the testing, noting that if her gender was really such a concern, they should have tested her before she even had a chance to run. Donald Lee of the Democratic Athletics alliance places the blame on South African athletics officials, noting that they should have tested Caster before allowing her to run on the world stage. As he tells the Guardian: "Caster Semenya's dignity has been walked over and her privacy denigrated." Caster is now reportedly receiving counseling in order to deal with the trauma that the test results—and how they were broadcast across the world. 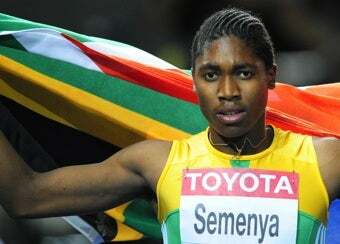 Semenya's mother compares the officials' handing of the test results to "thieves who break into your house and do what they want," and she isn't wrong; in rushing to discover Caster's biological gender traits and sharing the results of the tests with the world before she could even process them, they apparently forgot that she is, above all, a fellow human being.